Danny Dorling – 丹尼·道灵 » News » Rule Britannia at twelve days until Brexit – Why did it get this far? Rule Britannia at twelve days until Brexit – Why did it get this far? The deadline is now Friday 11pm April 12th 2019. A 30 minutes talk by Danny Dorling in the free Blackwells Marque, Oxford Literary Festival, The Bodleian Quad, Oxford, March 31st 2019. Join Danny Dorling as he explores his book ‘Rule Britannia‘ co-authored with Sally Tomlinson, which argues that the vote to leave the EU was the last gasp of the old empire working its way out of the British psyche. Fuelled by a misplaced nostalgia, the result was driven by a lack of knowledge of Britain’s imperial history, by a profound anxiety about Britain’s status today, and by a deeply unrealistic vision of our future. In this wide-ranging and thoughtful analysis, ‘Rule Britannia’ argues that if Britain can reconcile itself to a new beginning, there is the chance to carve out a new identity. ‘Rule Britannia‘ is a call to leave behind the jingoistic ignorance of the past and build a fairer Britain, eradicating the inequality that blights our society and embracing our true strengths. The image below was drawn (by others) using Lord Ashcroft’s Exit Poll data. 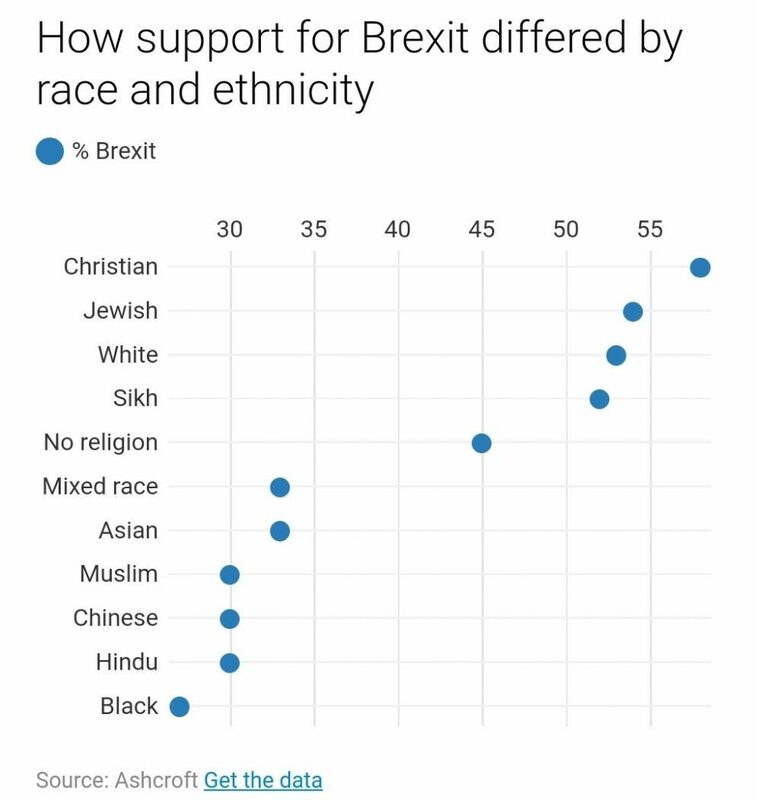 Note that the sample size for Sikhs was only around 20 people and so is unreliable.It was, of course, the ‘white middle class’, especially the older members of that class who more often voted Conservative or UKIP, that group provided the great bulk of Leave votes in 2016, especially those living in the South of England – but why did they? Support by Brexit on June 23rd 2016 by ethnicity and religion (Lord Ashcroft exit poll).